Goodreads Summary: Jane Eliot wears an iron mask. Now Jane returns to the war-torn country to help a fey-cursed child. Helping the unruly Dorie suppress her curse is hard enough -- she certainly didn't expect to fall for the girl's father, the enigmatic artist Mr. Rochart. But her blossoming crush is stifled by her own scars, and by his parade of women. Ugly women, who enter his closed studio -- and come out as beautiful as the fey. Jane knows he cannot love her, just as she knows that she must wear iron for the rest of her life. But what if neither of these things are true? Step by step Jane must unlock the secrets of her new life -- and discover just how far she will go to become whole again. 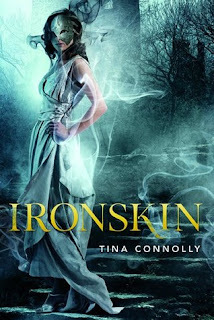 Why am I waiting on Ironskin? The summary had me at fey curse and Great War, but the awesome cover really sealed the deal. What books are you waiting on? Wow! This sounds wonderful. How have I not heard about this? The cover is definitely eye catching. I love the sound of this book! Will have to take a look at it! I am super pumped for this book! Steampunk AND Jane Eyre? Awesomesauce. Alright this sounds crazy awesome, it's totally going on my list to Tor!! Thanks for sharing!! WHOA, what an amazing concept. I hadn't heard of this one, thanks so much for the heads up! Like I needed any more books on my teetering TBR list, hah. What an awesome cover and it sounds amazing! Here's my WoW this week. Happy Reading! A steampunk retelling of JANE EYRE with fairies, sounds good. This sounds great and I love the bad a$$ cover.